This painting came about this week after two separate occasions last week when immediately I knew that God’s assigned angels were protecting us. I thank God and give Him the highest praise. Many scriptures mention about angels. His angels are messengers and they are sent to help and protect us. God takes care of all things. His faithful are always divinely protected. When I started painting I could see very large angel wings in the background, I could also see the Lion of the Tribe of Judah. God was speaking to me about prayer and His living Word as I saw the woman holding a bowl of incense and it also looked like a book. Prayer unlocks the door and is the entrance into the heart of God. Our prayers go up as incense to heaven and directly align us with our Saviour. God is preparing a place for us as we obediently serve him, he is guiding us into the land of promise. Exodus 23:20 tells us so. “The eyes of your understanding being enlightened, that you may know what is the hope of His calling, what are the riches of the glory of his inheritance in the saints”. “At the time they will see the Son of Man coming in a cloud with power and great glory. The scripture in Proverbs 29:18 says that without a vision the people perish. Without revelation passion diminishes and the fire burns out. 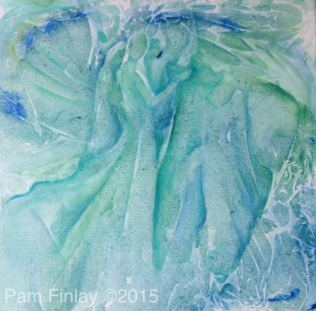 When our spiritual eyes are open to see we become inspired and revelation comes forth. We burn with a deep desire for the Lord. We are reflectors of His light, glory reflectors, illuminating His light to the earth. As I was painting the peacock I was also reminded of the scriptures in Revelation 4:6, Ezekiel 10:12 and Ezekiel 1:18 which refers to the wheels and the four living creatures with eyes all around. The eyes are everywhere and are looking to Christ. The rings of the wheels were “full of eyes”. I also found the scripture in Zechariah 3:9 very interesting speaking about the seven eyes on that stone set before Joshua which the Lord of Hosts will engrave an inscription on and He will remove the iniquity of that land in one day. The number seven speaks of perfection. Revelation 5:1 describes the opening of the book “sealed with seven seals”. I was also led to the scripture in Ezekiel 1:16-18 when it mentions the appearance of the wheels and their workings was like the colour of beryl and all four had the same likeness. You may wonder how these scriptures refer to the peacock but as I was led to the scriptures more was revealed. Through the colour of the peacock God was revealing the colour “beryl”. 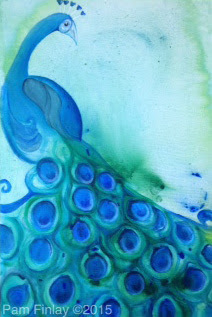 The colour of beryl is aquamarine – blue to blue green and this was the colour God led me to paint the peacock. The colour of the wheels in Ezekiel’s vision was as the colour of a beryl stone. It also speaks of the beryl stone in Daniel 10:6 seeing a radiant Christ in glorious splendour. “His body also was like the beryl and his face as the appearance of lightning, and his eyes as flaming torches, and His arms and His feet like burnished brass, and the voice of His words like the voice of a multitude”. The other thing the Lord was pointing out to me in this painting was the number of peacock feathers. When I counted the number it came to 22 and Holy Spirit was leading me to seek out the biblical significance of the number 22. When I searched I found that there are 22 letters in the Hebrew alphabet, and this number of letters proclaims the message of the eternal gospel. There There are other scriptural references regarding the number 22 but what I found interesting was the last book of the bible, the book of Revelation contains 22 chapters. The number of revelation is the number 22. The divine seal of scripture (the perfect circle) is the number 22. The Hebrew letter “Tav” is the 22nd letter of the Hebrew alphabet. This letter is called the Seal of God, the Seal of Truth. It is a time to see and seek God’s word, His revelation and cultivate prophetic sight, opening the eyes of your heart to understand His word and seek His truth.